Let’s get sconed! 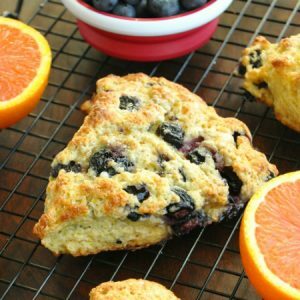 These sweet and sassy honey glazed orange blueberry scones are easy to make and bursting with berry flavor! Serve them up for a tasty breakfast or brunch. Ohmygosh guys — I am so sconed right now! Of course I’m referring to what happens after straight-up inhaling two giant, fluffy biscuit-muffin hybrids straight out of the oven. Word to the wise, biting into molten hot blueberries can be a wee bit painful. In fact they resemble lava. Cue the happy dance. They’re fantabulous. Sweet and refreshing with a crumbly crust and a fluffy, super-soft center… Done deal! If you come over and offer to do the dishes I’ll even bake you a big batch of these honey kissed scones. You know you want to! I didn’t think it was possible for me to love another scone as much as my Lemon Blueberry ones, but this tasty twist on my go-to scones is fantastic! Now deciding which to make for weekend brunches is going to be really flipping hard, right?! I suppose I could just let the contents of my fruit bowl decide. Though when I have both lemons and oranges on hand I’ll have to resort to eenie meenie miney mo or russian roulette to decide. Eh… maybe not the latter… Could get a wee bit messy! Let’s get our scone on! Let's get sconed! 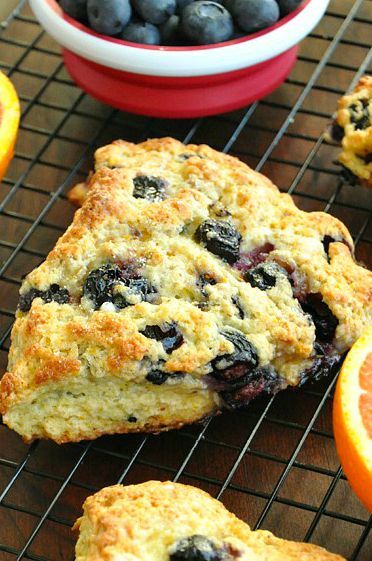 These sweet and sassy honey glazed orange blueberry scones are easy to make and bursting with berry flavor! Serve them up for a tasty breakfast or brunch. Preheat oven to 400 degrees F and lightly grease a baking sheet. If using frozen berries, defrost before baking. The recipe might still work with fully frozen berries but I haven't tested it out yet. So defrost 'em or simply grab a carton of fresh berries! In a large mixing bowl, stir together dry ingredients: flour, sugar, baking powder, baking soda, and salt. Cut in the butter with a pastry cutter. I don't own one so I minced the chilled butter into small cubes and then cut into the flour mixture using a pair of sharp knives. You can also easily grate the butter into the flour using a box/cheese grater. In a separate bowl, whisk together your egg, milk, yogurt and vanilla. Use a fork to move the flour mixture to the sides of the bowl, making a hole in the middle, then pour the egg mixture into the center. Stir until just moistened, then carefully fold/knead in blueberries. Some will remain whole and some may smush into oblivion, blueberries have a mind of their own. At this point the mixture will probably seems fairly dry, which is absolutely what we're going for here! If needed, add a tablespoon of milk to moisten and knead for 3-4 strokes in the bowl. Grab a sheet of parchment paper and lightly sprinkle with flour to prevent sticking. Gently knead your dough until smooth, trying not to exceed 12-15 total strokes if possible. Shape into a 7 inch circle on your baking sheet and cut into wedges. Glazing pre-baking will give you a crusty-crunchy-sweet outer layer to your scones. If you prefer them softer on top add the glaze after baking. Or you can go nuts and add some before and a little extra after. I might be guilty of the latter. Love it so. If you've decided to add your glaze prior to baking, add a light drizzle to the scones and sprinkle each with a teeny bit of sugar. Bake at 400F for 15-20 minutes, until golden, using a toothpick to test the center. Move to a wire rack to cool and enjoy! They're fabulous straight from the oven or cooled to room temperature. In case you actually wind up with leftovers, wrap tightly with saran wrap and store at room temperature for up to four days. They're great for grab-and-go breakfasts and snacks! No powdered sugar? No problem! Whip up the glaze using extra honey and skip the sugar entirely. You can also whip up a creamy icing by using cream cheese instead of [or in addition to] the powdered sugar and upping the honey content. Glazes and icings are insanely versatile and fun to experiment with! I wanted a slightly tart glaze and used cara cara oranges for the scones though any orange will work and you can even use a lemon! 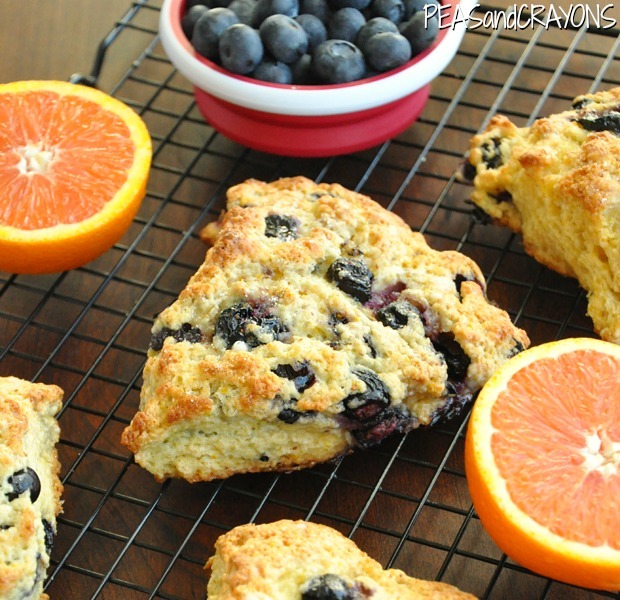 If you get a chance to try these honey glazed orange blueberry scones, let me know! Leave some love in the comment form below or tag your photos with @peasandcrayons on Instagram so I can happy dance over your creation! I goofed in one batch and used salted butter instead of salted, but I loved the saltier scones so much that I might make that mistake a second time! Totally up to you and your palette! Also, instead of the yogurt/milk combo, feel free to use 1/2 cup of buttermilk or even lowfat kefir probiotic yogurt milk. I’ve made the scones with all three dairy options and they all work flawlessly. I’m totally stealing your catchy phrase…my family is sconed too! Incredible recipe! These are absolutely perfect for Mother’s Day brunch! These scones look amazing! Pinned and shared! That orange blueberry flavor is perfect for spring! That honey glaze sounds amazing too! these are in my oven RIGHT THIS VERY SECOND! thanks! *HAPPY DANCE! * Thanks Naomi! Let me know what you think! Oh you’re killing me. i want to stop everything and go make these RIGHT NOW because I freaking love real scones, not those bricks they sell at Starbucks. And these look like real life actual scones. I die. No bricks here =) Just a perfect golden crust and a fluffy center! I am just going to stare at these until the WIAW post is up. I could go all day. They look wonderful! I made these yesterday and they were delicious. I did not have any all purpose flour so I used a mixture of teff and spelt flour. They werent as fluffy as they were in the picture, but needless to say delicious. I love scones. I do cranberry/orange, but I never thought of blueberry/orange. Ahhhh do it do it! Thanks Kelly! Ahh! Yay!!!!!!! So so glad they were a hit! =) Thanks Sydney! I love the combo of blueberries and orange. So yum. I love citrus. I need to pin these and make them soon 🙂 I think I have a weekend project. I haven’t made scones in months and I loved them then. Time to revisit. Thanks Shellsea!!!!! I forgot they existed until recently too! They deserve a revisit for sure! Blueberries and oranges? These look amazing! I have a confession, though… I’ve never made scones before and I’ve only eaten them a handful of times. I think maybe it’s time to change that? Oh it’s time! You will rock them! Made these today (my first ever attempt at a scone) and they came out great! So delicious! Thanks! Genius. You are a genius. I do orange scones with cranberries and white chocolate chips, but these sound so much better. Plus, blueberries keep us young. White chocolate!? Oh that just sounds amazing! OMG – I want to make these but I’ll substitute raspberries. They look awesome! These look crazy good. I am definitely going to have to make these for my brother for his birthday that is coming up. He is a scone-fanatic. Plus citrus is so good right now. Ohmygosh I hope he goes nuts for them! Let me know how it goes! Happy early bday to your bro! They look delightful! Such pretty photography too – in Australia (probably from English heritage) we cut out scones with scone cutters so circle shape. Americans have a better idea though chop into wedges – super easy! I love blueberry anything pretty much! These look fab! I always balkes with salted butter. That extra salt with sweet is soooo good. I never thought to sneak salted butter in recipes but I might start trying it with more things! Of course you already do that – you’re brill =) I’m still sicky but much much better today! Thanks love! Scones are definitely one of my favorite breakfast snacks. These sound absolutely amazing. I will definitely have to try. Thanks for sharing! I’ve never made scones before! They always look and sound way too fancy for me to try! 🙂 Maybe just maybe I’ll give these a whirl! 🙂 They do look delicious! I always thought the same thing! 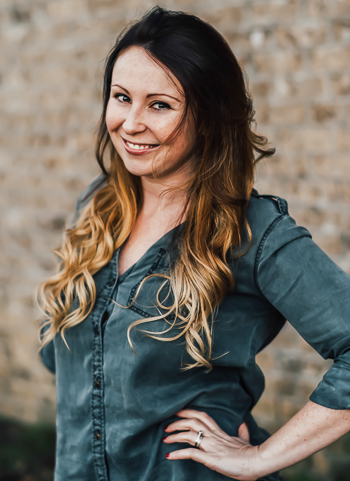 It took ages for me to experiment with them and I’m head-over-heels with how simple they are! It’s just like baking muffins! hahaha I hope your recovering from getting super sconed this weekend! These look amazzzzing!